Replace the bracketed items with whatever the appropriate text is. 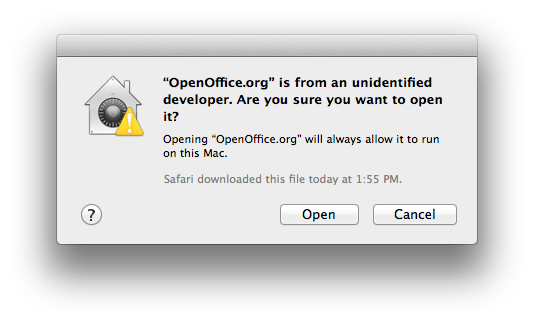 Here is a recent warning for OpenOffice.org, with a slightly different wording. Any way, usually I will see this only the first time I run a program. Recently, with an update of Skype, the warning showed up every time I started the application. It was more than a little annoying, especially because it never happened before. Today, I finally decided to find a solution. Without boring you with the details, here was the issue. When tried to upgrade Skype, it wouldn’t let me do it with the regular “drag and drop onto the Application folder.” I can’t recall the exact message, but it was something to the effect of, “The existing application won’t let you do this.” So, I logged in with my administrator account, and tried again. No dice – I got the same message. So, I uninstalled the existing version by dragging it from the Application folder to the trash bin, then installed the latest version. That made it work. Unfortunately, that was also the cause of the repeating warning. It seems that the account that installed the application has to open it, then click past the warning. Otherwise, all the other users of the system will repeatedly get the warning every time they try to run it. So, I logged in with my administrator account, opened Skype, clicked past the warning, then logged out. When I logged in with my regular account, the warning didn’t reappear. The lesson? When you install a program on Mac OSX, open the program first before logging out. This entry was posted in Mac, OSX and tagged Apps, Computers, Helpdesk, Mac, OSX. Thank you. Despite my having Macs for 2+ years, I still consider myself somewhat of a newbie. Any time I find something I didn’t know, and that helps me, I’ll share it here – hopefully it’ll help someone else. We’ll see how long it lasts. My macbook (which I switched to when Vista came out) officially can’t be updated to Mountain Lion so I’m investigating my next step. Vista came out in late 2006, so five years is a respectable practical lifetime for a laptop. Do you NEED to update to Mountain Lion, or can you continue to use Lion for now? I figure I can survive another year or two on the current version before things go completely down hill. I’m a predominantely web-based computer user with side treks for Dosbox and Herolab. Nothing that’s going to require timely upgrades. The truth is, every OS has its strengths, weaknesses, and outright idiocies. Use the best tool for the job at hand, or make due with what you have or want to use. Thought it was user permissions related issue … Thanks for the tip, a time saver !